Since the beginning of time, women have sought the look of beautiful eyes. Tradition has it that Cleopatra was the inventor of the powered eye cosmetic, kohl, and for centuries after, women have continued to beautify their eyes. Now medical science and cosmetology have merged together to create a new technique for enhancing eyes, eyebrows and lips: Implanting a thin dark line along the upper and lower lids to replace the conventional eye-liner. A semi-permanent eyeliner using colour of a vegetable and mineral origin, unlike the permanent ink tatooists use. The machine used to perform the pigment implantation treatment is a combination of safety, simplicity and the latest in tecnological advancement. Unique safety features were designed to comply with current sterilisation guide-lines, set by the Centre for the Disease Control Agency of the United States. During the consultation you will be told in detail of this remarkable process which gives you the colour and contour you desire. Your acceptance with your signature to the shape must agree upon before commencement of the treatment. The procedure time varies depending upon the area being treated. 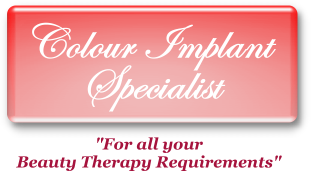 The therapist uses a special machine and needle to implant the line of colour to the skin. This is a delicate undertaking and is performed under the utmost sterile conditions. Anaesthetic cream is used to reduce any discomfort. Then from a palette of rich natural looking colours - blacks, browns, greys, beiges, reds and pinks, together you will select the exact colour that works best to illuminate your eyes, shape your lips and eyebrows. The result is a natural look that's uniquely yours. Minimal crusting will form on the eyebrows. On some persons where eyeliner has been created there could be some initial swelling which will subside gradually. This may also occur in the creation of lipliner. It is necessary to re-treat the whole area 2-3 weeks after the original treatment because of colour absorbency, which will be between 30 - 50%. Should you prefer continual darker colour and defined eyebrow shape, you can have more colour implant after twelve months. It is advisable to have a retouch before the shape changes and the colour completely disappears otherwise the full price will be charged. This process will last for 3 to 5 years. It is not indelible or permanent, but it will fade away gradually, depending on the individual skin colour and metabolism of the skin renewal. The technique of colour implantation is an adventure into a fabulously exciting make-up technique. It is an exploration of your own potential to discover how beautiful you really can be simply by trying what you have never tried before.